Bucks forwards Giannis Antetokounmpo, Khris Middleton and John Henson (31), as well as center Larry Sanders (in black) are key parts of the Bucks' young core. MILWAUKEE — Adversity has certainly struck the Milwaukee Bucks in a variety of ways this season, turning a team with goals of making the playoffs into one focused on development of young players. If the Bucks were a group of mostly veterans sitting at the bottom of the NBA standings, it probably wouldn’t matter how they were losing. But Milwaukee has seen its youngsters fight night-in and night-out despite a 6-22 record. While nobody enjoys losing, the young Bucks are gaining valuable experience in what otherwise would be a lost season. "The morale is really good," Bucks coach Larry Drew said. "The group has shown even in these type conditions that they can persevere. Given what our situation is, we don’t have quit in us. We’re going to go out there and play hard, and I’m going to coach as hard as I can. "As I told the players, we’re going to remain a team. We’re going to go out there and play hard, compete at a high level. Our players have shown an ability to do that." One would think it would be obvious a group of professionals would continue to work hard every day no matter what their record, but that’s not always the case. Veterans become sour when young players steal their minutes and teams begin to come apart. But thus far, the Bucks have stayed together. The evidence supporting that claim is easy to see. Milwaukee has played three overtime games in its last four and six on the season to put the Bucks on pace to break the NBA record of 14 overtime games. 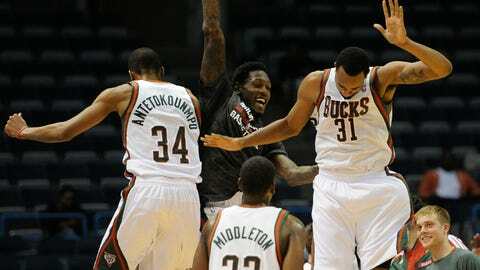 The Bucks have an even point differential over their last four games at 138-138 but are 1-3. They may be losing, but the kids are competing. "I think this is a great, great learning experience for our young guys," Drew said. "Going through situations like this, not only does a young guy get an opportunity to play, but he gets a chance to show what he’s made of. It’s a big, big learning curve for young guys." It may be too late to salvage this season despite reinforcements returning soon, but the benefits of five players 22 years old or younger playing in close games late will be reaped in the future. Rookies Giannis Antetokounmpo and Nate Wolters have all played more than expected, while Brandon Knight, Khris Middleton and John Henson have shown flashes of being pieces of the puzzle going forward. Caron Butler recently pointed out the tough-nosed style of basketball the young players have established of late and others have taken notice. "This team has a lot of fight in them," said Bucks center Larry Sanders, who’s been out since early November with a thumb injury. "They’ve been fighting. It’s not like we’ve been getting blown out terribly in all of our games. I feel it, and it makes me more excited to get back." However, don’t confuse resiliency with compliancy. The Bucks aren’t happy with where they stand, but they understand this is a process and brighter days are ahead. "No young guy wants to be in this position, I totally understand that," Drew said. "But as long as you play this game, as long as you’re in the NBA, you’re going to experience some situations that you don’t want to experience. The main thing is that you learn from it. The most important thing is you work out of it. "Certainly our young guys have shown that they can work through adverse conditions, they can persevere through tough times. They are out there playing hard and competing at a high level"
Drew says seeing his guys compete through countless injuries, being shorthanded all season and overmatched talent-wise in many games tells him a lot about who is in the locker room. "I’ve been in this league long enough that there are teams that get in these situations and you can see the results, how players react and how they play," Drew said. "This group is still focused, this group is still playing hard, this group is still laying it on the line. We’ve just came up short as far as finishing some games off. "There’s just no quit in us. We’ll continue to play hard as we can and sooner or later the ball will bounce our way." Sanders feels just adding a few more healthy bodies to the mix, himself included, could turn some of those close losses or near misses at the end of regulation into wins. "We’ll definitely have more bodies, so that will be good to give some guys some rest," Sanders said. "Maybe we’ll be able to have that extra boost at the end of the game that we’ve been lacking. There’s a small margin of winning and losing. Hopefully we can make that margin up a little bit."